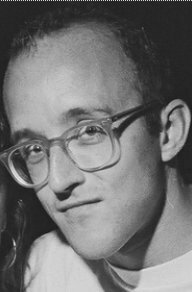 Happy B-Day to Keith Haring (May 4, 1958 – February 16, 1990), American, pop artist and social activist whose work responded to the New York City culture of the 1980s. Haring was interested in art from an early age. From 1976 to 1978 he studied commercial art at The Ivy School of Professional Art, an art school in Pittsburgh. He soon lost interest in commercial art and moved on to study Fine Arts. At age 19, in 1978, Haring moved to New York City, where he was inspired by graffiti art, and studied at the School of Visual Arts. He was also mentored by Andy Warhol. Haring was well known for his chalk pop art drawings in the subways of New York City. In 1981 he sketched his first chalk drawings on black paper and painted plastic, metal and found objects. 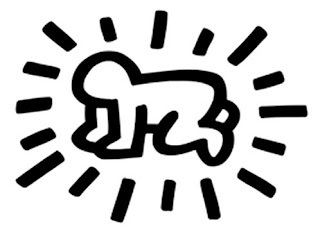 Around this time, "The Radiant Baby" became his symbol (see image above). His bold lines, vivid colors, and active figures carry strong messages of life and unity. Starting in 1980, he organized exhibitions in Club 57. He participated in the Times Square Exhibition and drew, for the first time, animals and human faces. Google celebrates with a Haring inspired doodle. 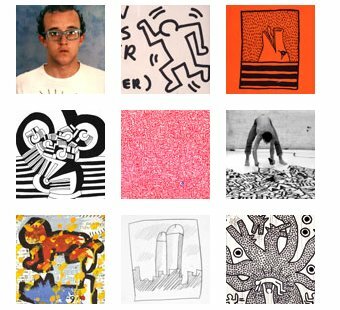 I never knew of Keith Haring, such an interesting guy, sad he passed so young but left quite an impression. Interesting to read about this. 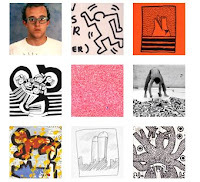 I checked out the links on your blog post and Keith Haring is very talented and was one of the top pop artists in the 80s. Ditto, for a pop artist to take notice of all the street art and become inspired to create such interesting art yet so simply, is amazing. I really like the Radiant Baby, his signature piece. I really like the google doodle, really a great rendition of Haring’s art. To think how a young guy from Pennsylvania can become so inspired by NYC graffiti and street art. This is what makes NYC the most cultural city in the world! This is so interesting to read and the simplicity and pureness of his art is quite amazing, and I’m not surprised he is known of one of Americas top pop artists. Like this blog post a lot and enjoy your other ones too. I enjoyed reading this and thought how special NYC really is and not surprised so many artists head there from all over the world, not just the country. Awesome blog, and really like this blog post a lot. Some NYC trivia I wasn’t aware of before. I enjoy your blog and enjoy your insights to all you bring to your blogs. Interesting, informative and topical.